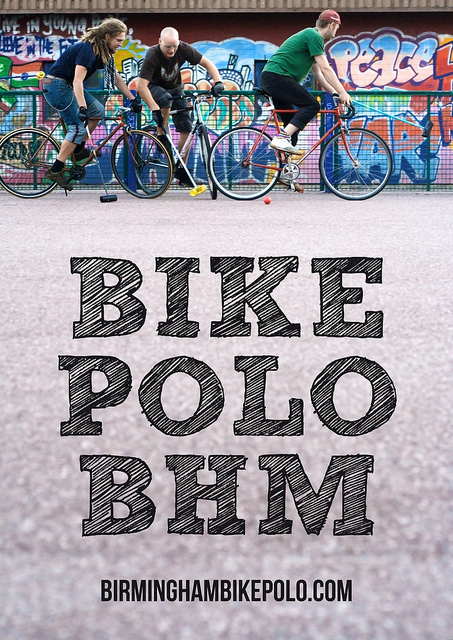 New Flyer | Birmingham Hardcourt Bike Polo, UK. Big love to Fin for getting these sorted. This is Birmingham Polo Flyer 2.o – the first one we used had specific times and locations where we play and hence became obsolete at the end of the summer. I really like the hand-drawn main font and of course the fact it features yours-truly ploughing through the opposition, albeit in a position of no danger whatsoever. I don’t have an image for the flip-side, unfortunately; but expect to see these in real-life locations around Birmingham (and Coventry courtesy of Sarah, Simon and the other guy whose name I forgot [Andy?]) soon. If you think you can help out distributing some of these, please either send me a message through this blog, or get onto the forum: http://www.lfgss.com/forum26.html, and private message Fin AKA Hyperallah. We have a limited amount at the moment, but hopefully we’ll be getting some more. Feedback from polo last night is that the lfgss.com forum is a bit scary to the first-time user, so hopefully with this flyer and this blog as our first point of contact we can continue to grow Birmingham bike polo. This entry was posted in Birmingham Bike Polo and tagged bicycle, bicycle polo, bike, bike polo mallet, birmingham, birmingham bicycle polo, birmingham bike polo, birmingham polo, polo. Bookmark the permalink.